The first week the Semi-Finals of NBC’s singing competition show “The Voice” has strong performances from the Top 5: Kristen Merlin (Team Shakira), Kat Perkins (Team Adam), Josh Kaufman (Team Usher), Jake Worthington (Team Blake), and Christina Grimmie (Team Adam). Each artist performed two songs. One song was selected by their coaches, and another song was picked by them. Most of tonight’s artists dedicated one of their performances to their friends and family’s for believing in them and supporting them in their music journeys. 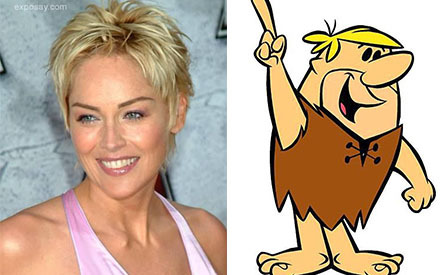 Blake Shelton compared Adam’s hair to Sharon Stone (l), and Barney Rubble (r). Adam Levine, still with blond hair, endured more jokes from Blake about his hair color, but got his chance tonight to return the favor to Blake for publishing his cell phone number on Twitter two weeks ago on the show. Usher opened tonight’s ‘Voice show by performing “Good Kisser” with such lyrics as “can’t nobody kiss it like you” while attractive dancers gyrate around him. Pictured: One of Usher’s “Good Kisser” dancers. Then host Carson Daly pulled movie star Mark Wahlberg out of the audience who was there to promote his latest film “Transformers: Age of Extinction”which opens in theaters on June 27, 2014. His co-star, Nicole Peltz, was also with him who said the them song of the movie is “Battle Cry” by Imagine Dragons. A Sneak-peek to the movie was shown next. Kristen said she played the violin and saxophone for two years each when she was younger. She says she didn’t like country music early-on until she started listening to Reba, Tim McCraw, Martina McBride, then started writing her own music. She’s singing “Gunpowder and Lead” song by Blake’s wife Miranda Lambert. Shakira said the pressure of the finals is stressful for the artists and ‘there’s only so much pressure one person can handle.” Kristen said, “I feel over-whelmed, but I also have to believe in myself.” Shakira said the song “Foolish Games” is a timeless song with a Universal appeal and the richness of Kristen’s voice will be a good fit. Kristen said she feels that she has to “give the performance of a life-time”. Blake “That’s the most connected that I’ve ever seen you be with a lyric. She dumped her heart and soul into that performance. That was moving.” Usher said, “This is 100 percent is on the incredible giant. You have an incredible hot young Cuban fire ball …this was definitely a good moment for you Pressure comes with this you either burst pipes or it makes diamonds.” Shakira “I’m not the only one here with chills. You are a story-teller. There have been great singers on this season. The way you tell stories is so emotional. I’m so happy with this moment. This was a beautiful rendition of ‘Foolish Games'”. Josh was nineteen years old when he moved to Indiana, Indianapolis. He formed the band “The New Etiquette”. He has support from his family and the city of Indianapolis. Josh dedicated tonight’s performance to them. Usher told Josh, “This is your make or break moment.” Josh explained why music is his life’s calling, “music is the one thing that I don’t ever have to force myself to do. I’ve tried a lot of things. This is the one constant thing.” Usher said Josh has landed on the top iTunes chart two weeks in a row and that is a sign that he should be doing this. “Love Runs Out” by One Republic is the song Usher picked for him. Adams’s gift for Blake was as Adam described it, “It’s a special gift because I thought I’d return the favor of giving out my cell phone number on The Voice to the entire world.” The gift was manure being poured on top of Blake’s beloved pick-up truck. Adam said “That’s crap, that’s manure!” Blake was not amused! Adam told Kat, “If you do the right things this this week, you could launch into the final three.” The song she is singing is “Chandelier” by Sia. Kat said the song is “a beautiful operatic rock.” Adam said this performance could be her “break-out” moment on the show. Kat said her local radio station was Country music. When she was 18 years old, she moved to Minnesota and started writing her own music which was Rock. she said her whole town supports her on “The Voice”. She is singing a favorite song “Let It Go” from “Frozen” movie of the kids that she Nanny’s. They pushed her to audition for “The Voice”. Jake said he took classes on agriculture in high school. His home town in Texas supports him and made shirts with his name on it. He said every time he goes on stage he’s thinking about his friends and family. Jake dedicated tonight’s performance of “Good Old Boys” song to his best friends back home who have always had his back Jake said. Usher said, “I love Jake. Every time – such a great representation of country. That big note you have at the end. You completely sold me at that moment” Usher said and he doesn’t like Country music. Jake is the last man standing on Blake’s Team. Blake picked “Heaven” song by Bryan Adams for Jake to sing. Blake said it’s a perfect moment to take a classic rock song and make it country. He also said “This song is perfect for Jake right now because it’s stripped down and acoustic”. 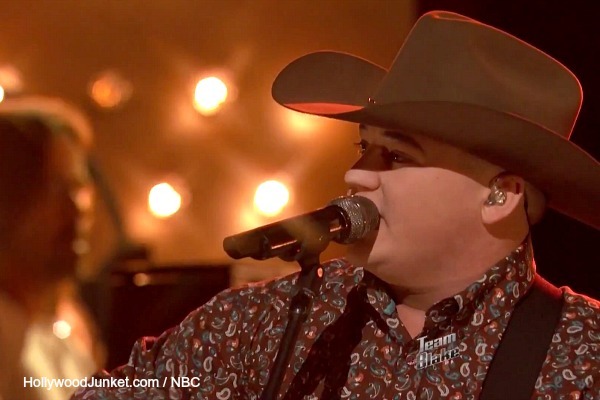 Once Jake was finished singing, a shot of his Mom and friend in the audience showed that they were moved to tears by his performance. Adam told Christina, “The thing that people love about you is you go above and beyond to be unique and stand out. You are not taking the safe route here. You’re fearless. He picked the song “Hide and Seek” for her to sing. Christina said about the song “It’s a huge risk doing this. But it’s going to take America by surprise. The chorus in this song it just punches you in the face”. She said if she’s off in the chorus, it’s going to fall flat. She said this song is the biggest risk that she’s ever taken and hopes that it will pay off. During her performance, a large amount of balloons were released onto the stage, audience and coaches. Watch THE VOICE season 6 episode 26 “Live Semifinals” first aired by NBC on Monday, May 12, 2014. This full episode is now available at HOLLYWOOD JUNKET until 06/19/14 courtesy of NBC. ENJOY!